Today’s marketers are expected to measure campaign impact on company revenues. And while they often turn to marketing automation or business intelligence tools to measure performance, these applications usually deliver fractured or even incorrect information when examined closely. More often than not, the information in the marketing automation system is different than the information in the CRM system, making it difficult for sales and marketing teams to work together and for marketing to optimize their program budgets. Marketers need a true marketing performance management system. With Response Management, CMOs get bullet-proof marketing data, board-ready charts and graphs, and the confidence to make informed investment decisions that return a positive ROI. Built natively on the Salesforce1™ platform and fully integrated into Salesforce®, Response Management provides the marketing attribution data and funnel analytics to optimize the company’s marketing mix, align sales and marketing, and drive more revenue. Response Management enables marketers to go beyond the reporting limitations of first and last touch campaign attribution methods. With Response Management, you can leverage powerful, weighted multi-touch attribution models to assign appropriate revenue credit to every campaign associated with an opportunity. With better visibility into campaign performance, marketers gain the insight and confidence to invest their marketing budget strategically to optimize results and maximize ROI. Ever been in a meeting where an executive wants to know what campaigns led to a won deal? The Full Circle Deal Explorer allows teams to answer these questions by displaying all the prospect interactions on a particular Opportunity. Marketers can drill down to view all critical campaign influence information in one place and see the primary marketing touch points: first touch, last touch, and primary campaign source. Deal Explorer also enables visibility into the revenue attribution for each campaign associated with the Opportunity based upon the influence model configuration. Share information about customers, prospects, campaigns and sales into a single, trusted view inside Salesforce, so everyone in the organization can see the same data. Response Management gives sales an easy way to track and follow up on every response across both Leads and Contacts. Based on your criteria, identify which responses are sales ready and assign and notify sales to begin driving the engagement. 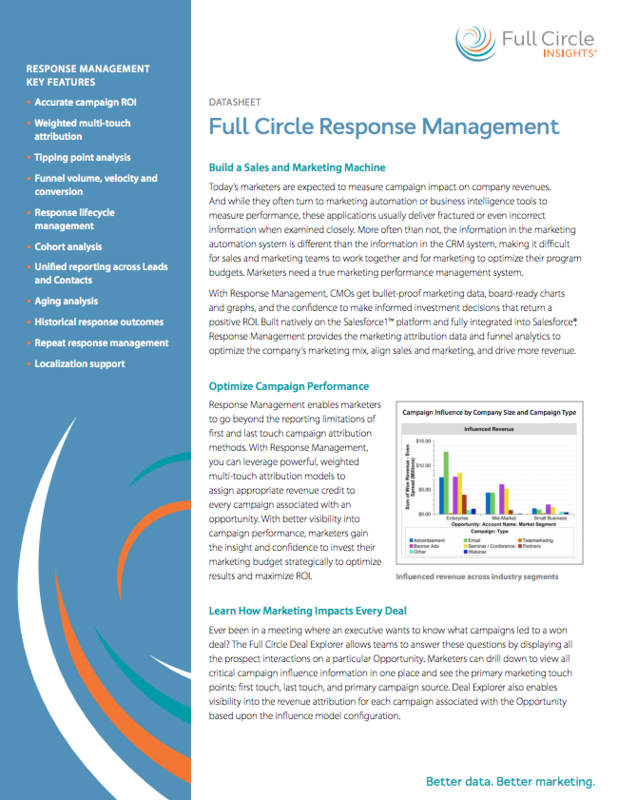 With Response Management’s unique tracking of current and historical data, both sales and marketing are given a unified view of campaign responses to ensure no Lead or Contact is left untouched. Download the Response Management Datasheet below for more information on this product.